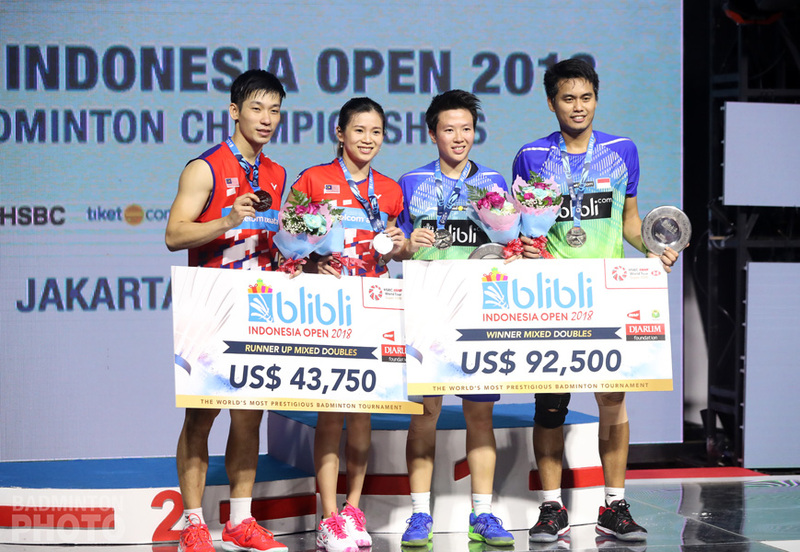 Ahmad/Natsir fullfilled their promise to win the title for the last time as partners while Kento Momota may just be getting started, with his own second Indonesia Open title. Indonesia’s mixed doubles stars Tontowi Ahmad / Liliyana Natsir (pictured right), again managed to finish the Indonesia Open as champions. The highly decorated pair already had Olympic gold and their first of two World Championship titles before they took their first home title, last year. In 2018, they emerged as champions after defeating Malaysians Chan Peng Soon and Goh Liu Ying (pictured below), 21-17, 21-8 in a repeat of the final of the Rio Olympics. Surprisingly, these two pairs had not met on court since that day in 2016, although Chan lost to the eventual champions at last year’s Indonesia Open, as well, with a different partner. Goh Liu Ying, on the other hand, admitted that the noise from home supporters really gave the Malaysians a lot of pressure: “The crowd was so noisy, I could not even hear my conversation with Peng Soon,” said Goh. “We could not beat them tonight. We didn’t play our best, while Ahmad/Natsir came with high motivation for playing in front of their supporters,” added Chan. This Indonesia Open also become the last appearance for Liliyana Natsir, who has decided to retire after the Asian Games in August 2018. “Winning is good but today I feel a bit sad too because this is my last chance to play in the Indonesia Open. Thank you for all the support given to me. I will definitely miss the moments when the crowd shouted our names to cheer us on,” Natsir said. “Sooner or later I will decide to retire. But still I want to win a gold medal at the Asian Games for the last time. I’ve never won one before so I hope I can get it this year,” added Natsir. 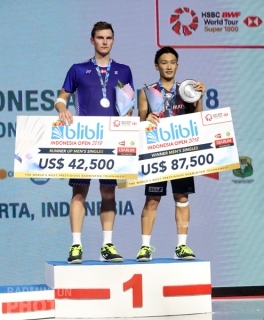 Japan’s Kento Momota (pictured right) added the the 2018 Indonesia Open to the title he won here in 2015, after beating men’s singles top seed Victor Axelsen of Denmark. Appearing as an unseeded player, Momota dominated the match from the beginning. Momota – who ascended to world #8 after the tournament began, on the strength of his runner-up performance last week – needed only two short games to clinch the men’s singles title. 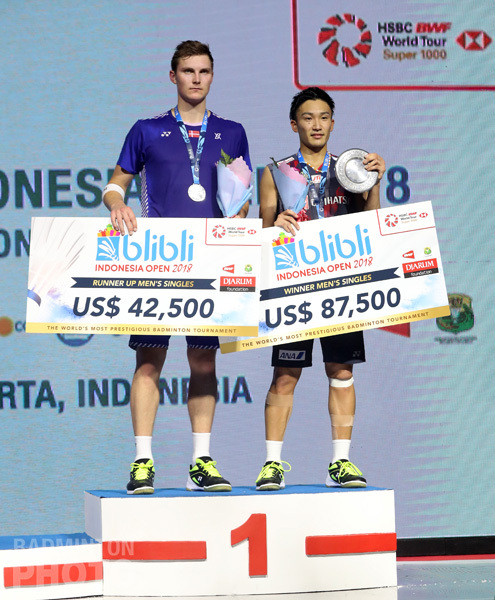 “I’m certainly satisfied to win at a Superseries tournament like the Indonesia Open, especially since I won in front of the fans here,” said Momota, who beat another Dane, then-defending champion Jan Jorgensen, when he first won the title here in 2015. The 23-year-old said he had no special strategy to face Axelsen in the final and was only trying to strengthen himself mentally by trying to play his best. After the match, Axelsen admitted that he performed poorly on this day and made many unforced errors: “I felt pain in my leg that made it difficult to find a good position to respond to my opponent’s attack, while Momota was playing very well today,” said Axelsen. With this result, the 2018 Indonesia Open has come to an end. Japan managed to take home two titles and Chinese Taipei one, while Indonesia kept two titles at home.